When it comes to our hair, we all want it to look perfectly pretty all the time. 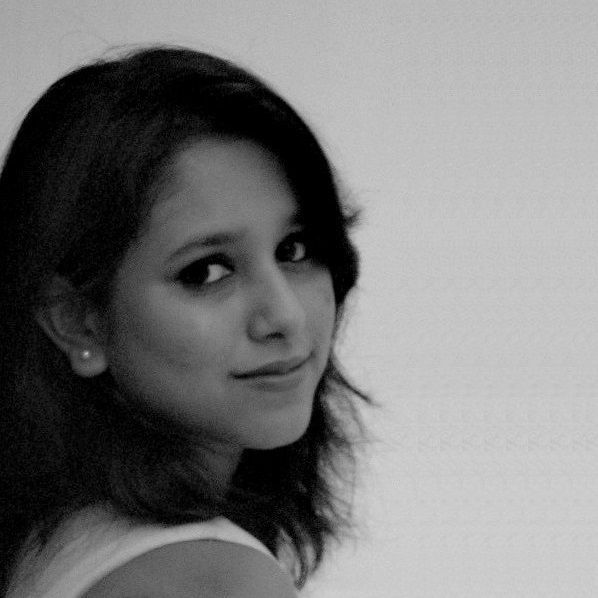 With longer hair, though, it gets slightly more complicated to achieve that. Especially if we don’t want to spend hours drying and then styling it! But guess what? 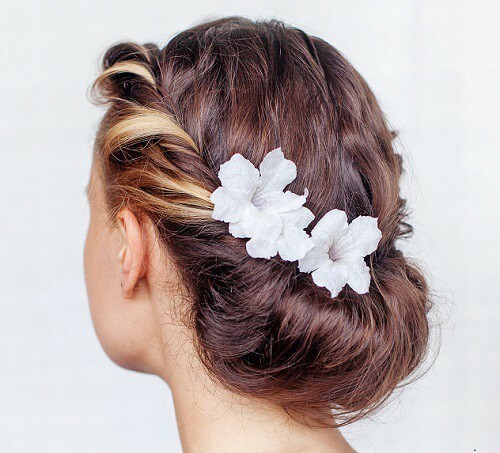 Hairdos for long hair don’t always have to be complicated - even if they look it.To help you out, we bring you 5 AMAZING updos that are oh-so-easy to achieve, but look SO fancy! Also, note: no blow-dryer required!! What you have to do Step 1: Brush your hair back from your face, with a middle to slightly off-centre parting. Step 2: Take a section of your hair from the right side of your parting, making sure to catch hold of all the from your hairline up to your ear. Step 3: Now twist the section in an anticlockwise direction, keeping the twists as tight as possible so that no stray strands escape. 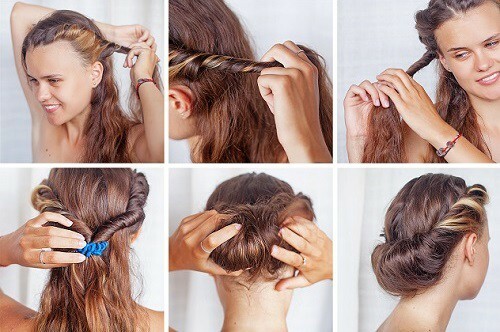 Twist as much of your length as you can. Step 4: Pull the twisted section back behind your head, right to the middle. Secure it in place with a hair clip. Step 5: Now do other side. That is, take a section from the left of your parting. This time, you need to twist in a clockwise direction. You want the twisted section to stand out slightly (like a fishtail braid). Pull the twisted section back behind your head, like you did with the other side. Step 6. Remove the hair clip, and tie the two twisted sections together with a sturdy hair tie. Step 7: Gather up the whole length of your hair and roll it up from the end. Tuck the roll into the “belt” formed by the twisted sections you’d earlier tied together. Secure with hairpins and bobby pins. 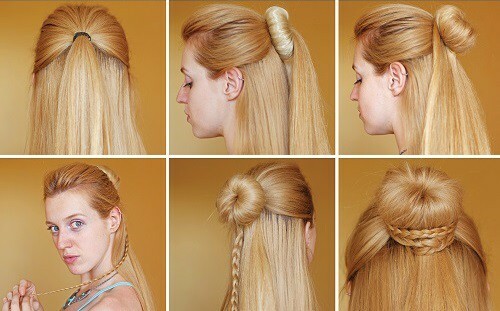 The longer and heavier your hair, the more pins you’ll need. Step 8: Catch any strays you might find, and make sure you tuck them all in! 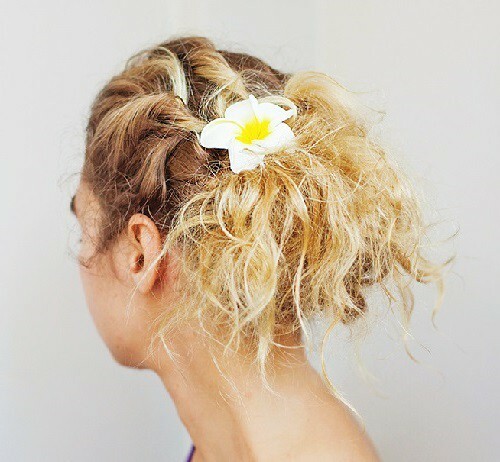 Spritz everything with a light spray in order to keep your strands and the bun in place. This isn’t essential, but it helps the style stay in place longer, especially if you have hair that tends to frizz easily. And if you want to add a touch of “princess” to your look, clip on a pretty flower or an embellished jura pin! What you have to do Step 1: Brush your hair back from your face. Make sure there are absolutely no knots or tangles. Smoothness is key for this one. 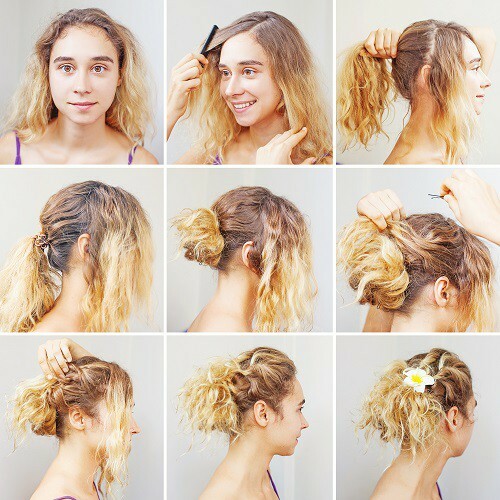 Step 2: Pull back the front half of your hair and tie it back in a high ponytail. Step 3: Slip the tied away section through a hair donut. Sit the donut firmly at the base of the ponytail. Step 4: Spread the ponytailed hair over and around the donut, making sure that it covers the donut completely. You can stick your finger into the donut hole to ensure that it spreads smoothly around it, and doesn’t crisscross across the little gap. Now slip a hair tie over the covered donut bun, securing it tightly around its base. Step 5: Gather about a third of the length of hair from the ponytail that is still free, and plait it neatly and tightly. Tie the end with a hair tie. Step 6: Wrap the braid you’ve just made round and round the donut bun, covering the hair tie you used to fix it. Once the entire length has been wrapped around the bun, tuck the end of the braid into the donut and secure it in place with bobby pins. What you have to do Step 1: Brush your hair back from your face, making sure not to leave an obvious parting. Step 2: Take a small section of your hair from your hairline (from one temple to the other) and make a tight, high plait across your crown. Use a hair tie to close off the plait. Step 3: Gather the rest of your hair and braid it, using the previously braided portion as one of the sections of the braid. This second, thick plait should be from your crown and up to the middle of the back of your head. Fasten with a strong hair tie (the same colour as your hair, mind you). Step 4: Brush out the length of the hair beyond the tie, making sure it’s smooth and tangle-free. Give the whole length a slight twist, and fold up the end of the length and ensure that you’ve caught it all. Step 5: Now start rolling the entire length back and up. Be careful not to let any strands escape your roll. Step 6: Roll right up to your crown, until you feel a tug at the base of the plait. Then pat the roll down into a semicircular shape (along the curve of your crown), and secure it in place using hairpins and bobby pins. Step 7: Put on the hair band to add a dash of glamour to your updo! What you have to do Step 1: Brush your hair, and comb it to a side. Divide it into two sections - front and back. Step 2: Pull the section at the back into a ponytail that is medium height. Step 3: Wrap the ponytail into a simple bun that you secure in place with a hair tie. Step 4: Pull a thin section of hair you’d left loose in the front, and clip it about mid-length at the base of your bun, using bobby pins. 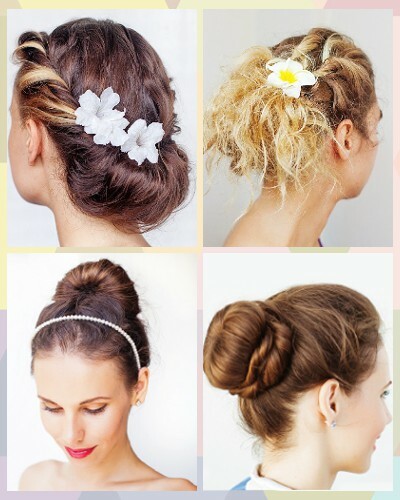 Make sure to spread the rest of the length of the hair across the bun, covering it. Step 5: Repeat the previous step with more sections of your hair from the front, securing them each with bobby pins. Crisscross the sections over one another to create a structured messy look. Step 6: Once all of it is pinned back, add a flower or embellished hairpin to finish it off - and look oh-so-fancy!